Happy Monday morning – I am writing this uncharacteristically the night before posting, whiskey in hand, music playing in a most civilised manner. 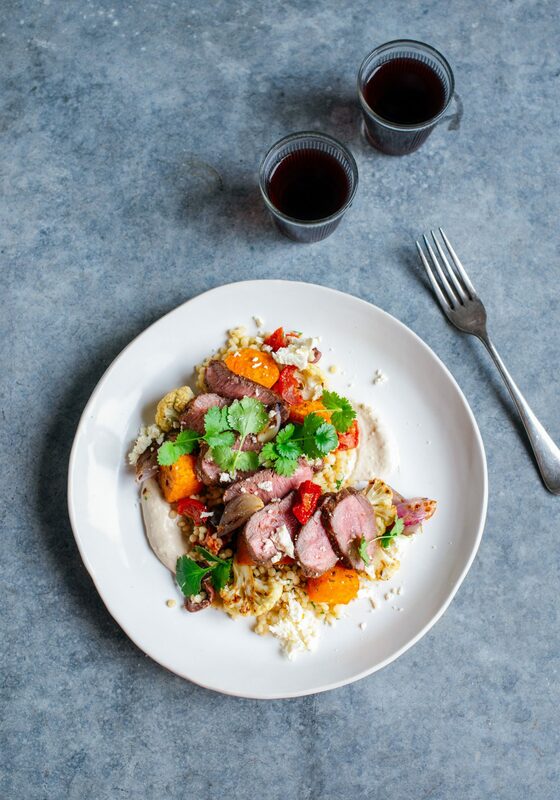 I have two easy recipes for you today – the first a gorgeous little date night dinner for two (or solo dinner for one and lunch the next day, a quick-cooked spiced lamb salad on a bed of Israeli couscous with sweet roasted red onions and kumara with cuminy cauliflower, salty olives and a good dollop of earthy hummus. 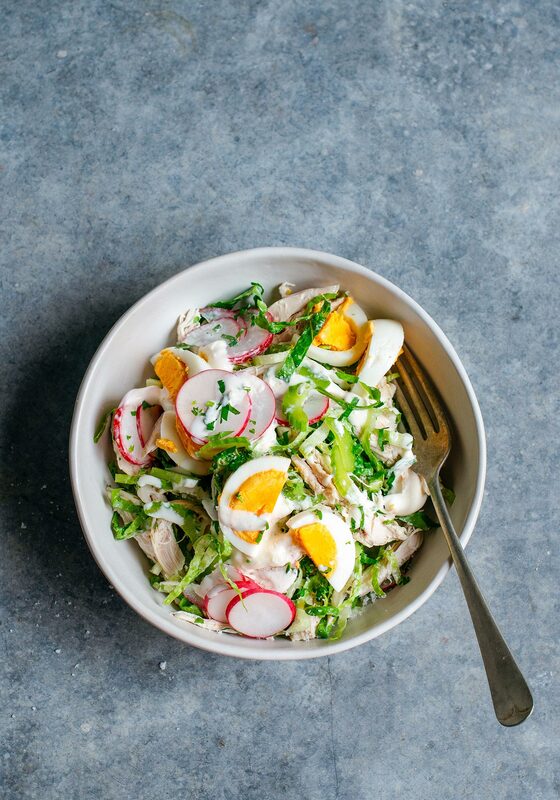 The other is an addictive little chicken and egg salad with crunchy romaine lettuce, celery and vibrant peppery radish wrapped up in lemony mayo. Both hint at the actual better-late-than-never arrival of spring with a lighter touch. (Both recipes also double easily to feed 4). And by crikey, in other news I have so much to share. First, and most importantly I was so lucky to zoom down to Welly on Friday to share in Hoob’s 21st birthday celebrations. It was such a bloody treat to have Pog and Hoob together with the darling Raven and we had a fabulous laughter-filled night enjoying pre-dinner cocktails, a vego feast at The Botanist followed by more drinks with a few of Rich’s best mates. Raven made a delicious gluten-free cake for the lucky birthday boy and the whole day and evening was truly special. Hurrah! Back home and it has been back to work today working on Dish, my next Smith & Caughey’s collab (coming soon) and…I am so excited to say MY NEXT COOKBOOK!!! Preheat the oven to 200˚C and line a roasting dish with baking paper. Rub the lamb with1 tablespoon of the olive oil and sprinkle over 1 teaspoon of ground cumin and the coriander. Put the kumara, onion and cauliflower in the roasting dish and drizzle with 1 tablespoon of the oil. Sprinkle over cumin seeds and season well with salt and pepper. Roast for 20-25 minutes, turning once during cooking, until cooked through. Heat the remaining oil in a frying pan over a medium high heat. Cook the lamb for 3-4 minutes on each side then set aside to rest. (3 for rare and 4 for pink). Cook the couscous according to packet instructions (8 minutes for Israeli). I always use black olives which haven’t already been de-stoned to ensure maximum flavour. To de-stone bang each olive hard using a flat-bottomed object (I use a large ramekin), this will split it open. Remove the stone, cut the olive in half and continue with the remaining olives. Whisk the hummus, yoghurt, lemon juice and garlic in a small bowl. Once the meat has rested for 5 minutes, slice it thickly across the grain. 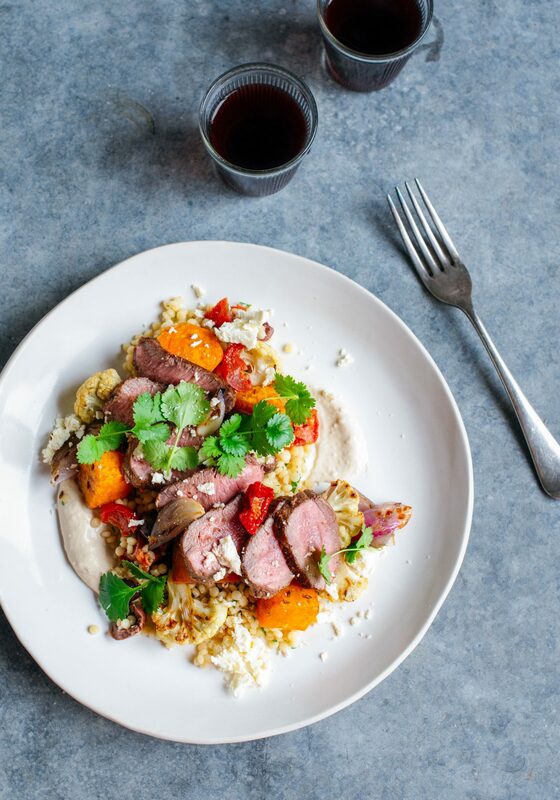 To serve, toss the vegetables, semi-dried tomatoes and meat through the couscous, stir through the herbs and feta and drizzle with the hummus yoghurt dressing. Pick through shredded chicken to remove any remaining bones. Bring a pot of water to a rolling bowl, add eggs and boil for 8 minutes. Drain and put in a bowl of cold water. Whisk the mayonnaise with the lemon zest and juice and set aside. Finely shred the cos lettuce and finely slice the celery and radishes. Bang the eggs on the benchtop to crack, then peel and chop. Toss the chicken, eggs, lettuce, celery and radushes together. Stir through dressing and parsley and season well with salt and freshly ground black pepper. The salad can be eaten as is with fresh bread on the side, but also makes a great sandwich filling, especially with a really grainy, wholemeal bread. Made this last night with just normal couscous with a few almonds, apricot slivers and pomegranate avrils. Also served a little pomegranate molasses on the side as it always hits the spot. Hubby gave it a 9/10 and wants on the regular rotation! Having said that, your loaded lamb meatballs are a 10/10 (even though I don’t make my own hummus).